Emma Gatewood told her family she was going on a walk and left her small Ohio hometown with a change of clothes and less than two hundred dollars. The next anybody heard from her, this genteel, farm-reared, 67-year-old great-grandmother had walked 800 miles along the 2,050-mile Appalachian Trail. And in September 1955, having survived a rattlesnake strike, two hurricanes, and a run-in with gangsters from Harlem, she stood atop Maine s Mount Katahdin. There she sang the first verse of America, the Beautiful and proclaimed, I said I ll do it, and I ve done it. 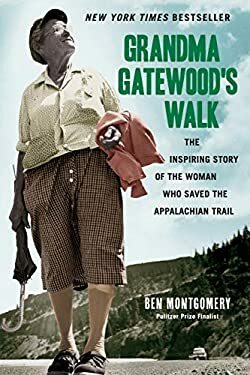 Driven by a painful marriage to an oppressive husband, Grandma Gatewood, as the reporters called her, became the first woman to hike the entire Appalachian Trail alone, as well as the first person man or woman to walk it twice and three times. At age 71, for good measure, she hiked the 2,000-mile Oregon Trail and came home with the keys to three cities. Gatewood became a hiking celebrity, and appeared on TV with Groucho Marx and Art Linkletter, and on the pages of "Sports Illustrated." The public attention she brought to the little-known footpath was unprecedented. Her vocal criticism of the lousy, difficult stretches led to bolstered maintenance, and very likely saved the trail from extinction. Author Ben Montgomery interviewed surviving family members and hikers Gatewood met along the trail, unearthed historic newspaper and magazine articles, and was given unprecedented access to Gatewood s own diaries, trail journals, and correspondence. "Grandma Gatewood s Walk" shines a fresh light on one of America s most celebrated pedestrians. The story of Grandma Gatewood will inspire readers of all ages by illustrating the full power of human spirit and determination. Even those who know of Gatewood don t know the full story a story of triumph from pain, rebellion from brutality, hope from suffering. "